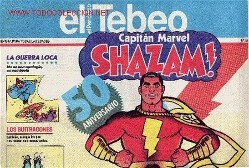 El Tebeo was a perodical magazine made by Josep Toutain in 1990. All kind of heroes were included: BATMAN, LANCE, TORPEDO, FELIX, JIM DE LA JUNGLA, TRIBULETE,POPEYE, PRINCIPE VALIENTE, CARLOS GIMENEZ, GARFIELD, TRILLO, JIM DE LA JUNGLA, BETTY BOOP, ETC. ETC. At least 33 numbers are made.